Giving back to the community is an integral part of being a family veterinary practitioner. Canine police officers and their handlers make many sacrifices in order to keep our communities safe. At times, they sustain injuries that can be extensive, costly, and permanent. The rigors of their jobs can also predispose them to chronic conditions that require some type of care for the remainder of their lives. During their service, the local police department is responsible for this cost, and we are fortunate that our local department has funding for this. However, once a K9 officer is retired, the handler is solely responsible for the cost of the care of this animal. 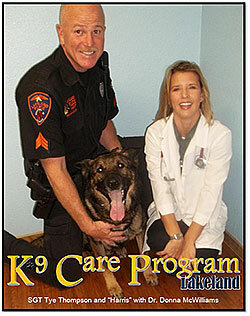 Our purpose is to provide a structured program that would allow Lakeland veterinary hospitals to donate their time and services to care for our local canine police force throughout the life of the canine officer. By doing so, we will lessen the financial burden for these officers and their families as well as allow more funds to stay within the canine unit. Ideally, upon retirement of the K-9 Officer, the veterinary hospital who provided primary care for that K-9 officer while on active duty would assume financial responsibility for the wellness care needed for the remainder of the K-9 officer’s life. We are grateful and pleased to announce that as of January 2019, additional funds may also available for exigent circumstances above and beyond normal wellness care through the Lakeland Police Foundation.